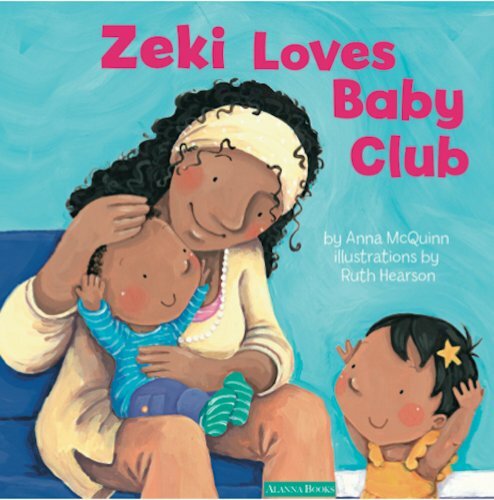 In this charmingly illustrated, sturdy book we join Zeki and his mother as they visit the library for Baby Club. After greeting friends they sing the happy song, play peek-a boo sing more songs, make animal sounds, do some action rhymes, join in with favourites ‘The wheels on the bus’ and ‘Zoom to the moon’ before settling down for a cuddle, storytime and all too soon, it’s time to say farewell to friends old and new. At the end of the book are the words of all the songs and rhymes featured together with some useful tips on presentation and information on how songs and rhymes facilitate language development. Happily in the London area and suburbs, such sessions as Anna McQuinn presents still thrive in local libraries; sadly due to cutbacks and closures this is not so in many rural parts. However, this book itself provides a great opportunity to share a wonderfully inclusive, simple story and enjoy a sing-along-session with the very youngest. A copy should be given to all new parents.